It will be about 400 pages…. There will be seconds blacked out…. The Grand Jury info will be excluded…. The report will be analysed by the media extensively …. Trump & Co. will be holding their breath…. Oh, and there will be more even after this…. Justice Department spokeswoman Kerri Kupec said Monday that a redacted version of special counsel Robert Mueller’s report is expected to be released on Thursday morning. 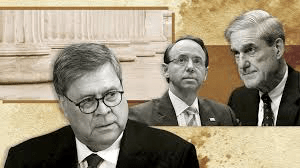 Barr told a House Appropriations subcommittee that once the redacted version of the report is sent to Congress, he would be “glad to talk to [House Judiciary] Chairman Nadler and [Senate Judiciary] Chairman Graham as to whether they feel they need more information and see if there’s a way we could accommodate that.”….